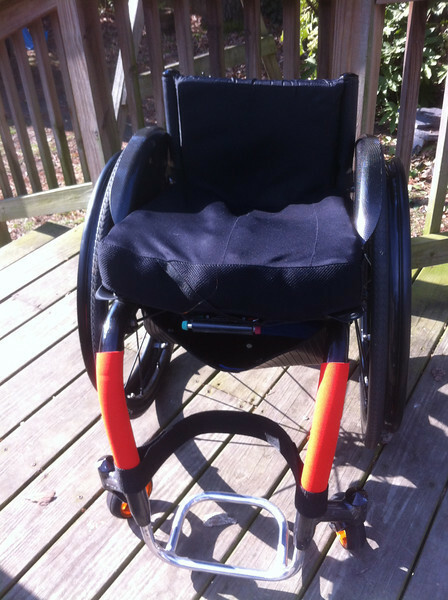 Anyone have a magnesium lasher sport wheelchair? If so what do yo think of it? 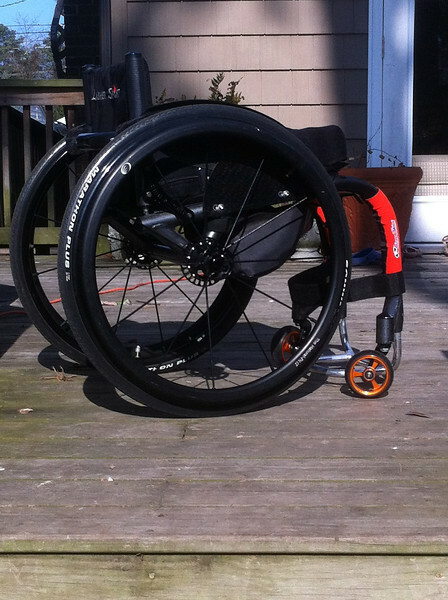 I'm looking at getting one with some spinergy wheels. I currently have an aluminum Tilite zra that I've had for about 3 years and it's pretty beat up. I'm needing to get something lighter due to recent shoulder pain. Yeah I have 2 BT-Mg chairs. I like them. Quite sturdy. One is ~9.5 years old and one is ~7.5 years old. The racing sail cloth upholstery is incredible. Still perfectly intact and hasn't stretched a bit. No issues at all and they are used daily. Well, I caused one issue with each chair, by over torquing one of the foot rest set screws on each chair. Torquing steel set screws into Al/Mg alloy can easily strip the frame threads. I fixed both myself with a simple tap/dye kit. I was in Las Vegas a couple of years ago to visit my money. My wife and I rented a van one afternoon and went to Lasher's shop. We had an appointment with him as we had spoken on the phone. He has some nice stuff but he kind of had a crude or inexact way to measure me for a chair. Knowing the chairs are not too adjustable, it concerned me. When I got home I called, left messages and emailed him a couple of times with no response. I thought he went out of business or something and was thankful I hadn't given him a deposit on a chair. My advice...be careful. He was very nice to talk to and seemed eager to do business but I could never dish out 6K to him and expect satisfaction. To be honest, I haven't had awesome post sales service with them either. Can't say enough good things about the chairs, though. Service could be better. Wanted to change a part out one time, called him up, was told, "I'm in the wheelchair business not the wheelchair parts business." Sheeesh. 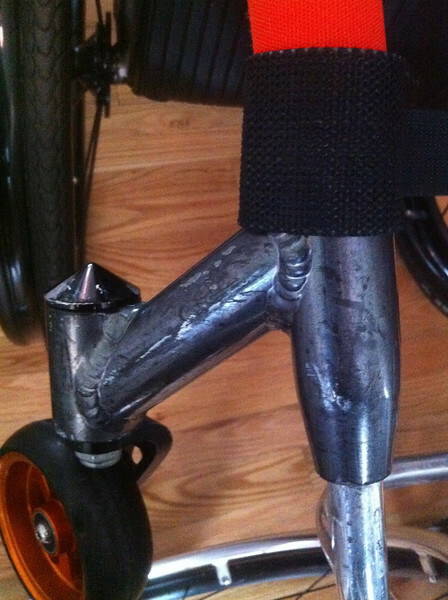 Great thing about a titanium wheelchair is that it takes a beating and looks the same. Can't say that about painted chairs. How does it look after all these years? They look mostly like crap, up close, but they're dark grey/black so from a few feet they look fine. FYI, Lasher chairs are powder coated or anodized, not "painted". Mine are powered coated. Quite thickly. It doesnt chip or flake off at all, but can scratch. I have no scratches to the metal though. This is the worst I could get. It's bad, for sure. The white marks aren't metal, they're paint from trim and bed frame. Hard to notice unless you're right up on it though. Looking good especially for an older chair. Thanks. 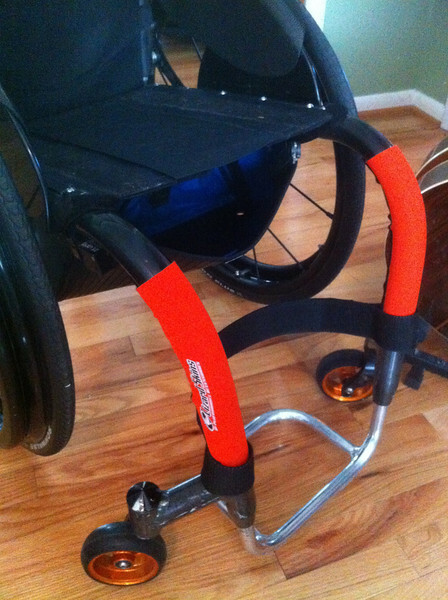 Has anyone gotten a Lasher Sport wheelchair?